Waterbased but permanent opaque paint stands out on any color background and will not bleed through paper. 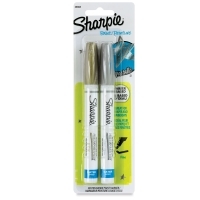 Great for mural and poster work, signs and scrapbooking, Sharpie Paint Markers are destined to become a favorite! 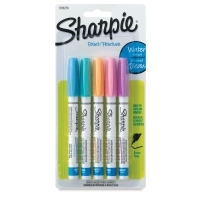 The ink in these markers is acid-free, quick-drying, fade-resistant, and water-resistant. 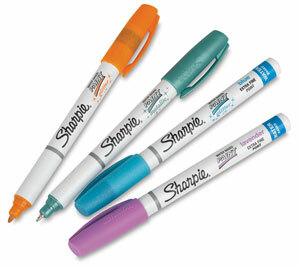 The ink is only permanent when used on paper. Set of 3, Metallic Colors — Includes one each of Gold, Silver, and Copper-Rose. 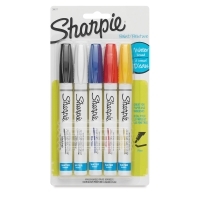 Set of 5, Assorted — Includes Black, Blue, Red, White, and Yellow. 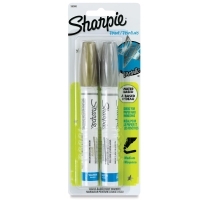 Set of 2, Gold/Silver Metallic — Includes Gold and Silver. 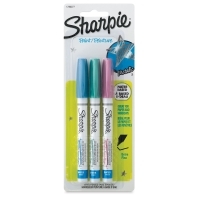 Set of 3, Dark Glitter — Includes one each of Dark Pink, Blue, and Aqua. Set of 3, Metallics — Includes one each of Pink, Blue, and Aqua..
Set of 5, Pastel — Includes one each of Pink, Blue, Peach, Aqua, and Lavender.